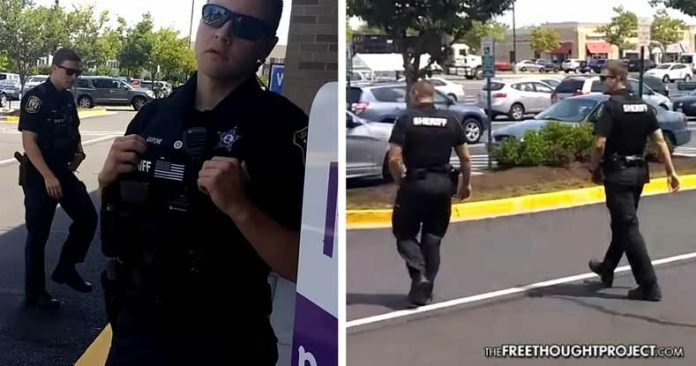 A man was approached by a cop while he was taking a break at work, and questioned about his well-being, all because he was lawfully filming the officer. Loudoun County, VA — Ordinary citizens sometimes complain when police intimidate or harass them, often with damaging emotional outcomes. Knowing what to do when one suspects they are being harassed by police is not always as easy as filing a complaint with the local police department. However, a recently uploaded YouTube video shows citizens just how easy it is to put stalker cops in their place. An unnamed grocery store employee had worked a full shift and was attempting to enjoy a smoke break when a Loudoun County sheriff’s deputy approached him. The unrelenting officer, who apparently was paranoid with a citizen’s right to film in public, again asked if the man was a Giant employee. The worker did not have to answer any questions, but gave a few tidbits of information indicating that he worked at the store, he was just having a smoke break, and he did not want to be bothered by any more of the officer’s questions. As The Free Thought Project has reported, officers will often pretend to care about someone’s mental stability as a legal way of detaining suspects “for their own safety.” In this case, the Virginia cop said he just wanted to see if the man was “okay” or not. “I’m standing up. I’m standing up. I’m standing straight up. Nothing wrong,” the man said, showing the officer he was not afraid of him, was complying with all of the local laws, and was not going to be intimidated. The officer replied, “You can do what you want” — that is, apparently, everything but go about one’s day without having to be forced to interact with a seemingly paranoid cop who cannot possibly allow a citizen to film the public servant conducting his public business in the middle of the day. Adding more comedic value to the encounter, the officer then began to explain the paranoia, by saying he noticed the man “staring” at him so he “circled back around” to investigate. “It kinda made me a bit nervous,” the officer said. “Yep. I’m sure it did. I’m sure it did (make you nervous). Two people going to get a cigarette probably does make you real suspicious,” the man replied sarcastically. The man then got the upper hand on the police officer, who had since called for backup. Apparently, the two men smoking outside of Giant raised enough suspicion to invest the time and money into having a second officer arrive on scene. The man then flipped the script on the officer and explained that he watched the officer stop and wait, then circle around and park and watch them as they got their cigarettes, and again stared them down. He asked the officer, “Why should we be nervous?” indicating the actions of the officer were much more suspicious than a couple of dudes getting some cigs after a long day of work. The cop then explained that he had the probable cause to investigate the men saying he “absolutely” got a call that the men were being suspicious, but later in the video, he admitted he received no such call. In other words, he lied. The backup officer arrived and asked if the man had been drinking. The man replied by saying he had been at work since 7 a.m. He demonstrated his discontent with the officers’ line of questioning and inquired as to why the officers “are still talking” to him. “I knew stuff like this happens. I just watch my back like you watch yours,” the man said, explaining why he was filming the officers. “We’re not trying to mess with you or anything like that,” the officer says, but suggests it is part of his job to investigate citizens when they are filming him. Nothing could be further from the truth. His job is to make sure no one infringes on the rights of citizens to engage in their First Amendment rights to free speech, which includes being able to film in public. “Okay. But nobody called you on me though,” the man said. It is at this point that the officer makes himself out to be a liar because he earlier told the man he “absolutely” got a call. “I don’t want to be recording you just like I don’t want to be standing here talking to you right now,” the man said. And with that, the paranoid cop and his sidekick finally walked away, and let the two men return to work.